Beijing, gearing up for the summer Olympics, is a fascinating if frustrating city. Traffic swarms, main avenues stretch ten lanes wide, hordes of bicyclists, many with children propped on the handlebars, dart around parked trucks, and the air tastes acrid, a result of the ever-present pollution. With 11 million people and an urban sprawl covering 10,450-square miles, Beijing, at first, overwhelms us. Think Manhattan (about 23 square miles) multiplied 400 times— taller skyscrapers, denser crowds, a constant stream of buses spewing exhaust, few tree-shaded sidewalks plus an-ever present, eye-burning grit. Connecting to Beijing requires work, but it’s well worth it. Here are some highlights and tips for families exploring Beijing, whether during or after the Olympic Games. The best place to experience this must-see is about a two-hour drive—56 miles—north of Beijing at Mutianyu. Here the Yan Mountains appear as a series of dramatic crests and the Great Wall’s ancient stones snake their way up and down the green ridge tops. 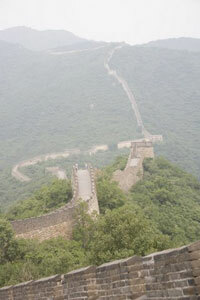 The ramparts, dotted with watch towers in this section, form a path between the peaks. Once we make our way past the gauntlet of merchants, board the cable car to the ramparts and walk on the wall through the first lookout tower, we see few other tourists. At times for brief stretches it’s just us--my husband, two children and I-- hiking. For the first time in days of exploring Beijing, we hear the wind in the trees as well as chirping birds. A Chinese sentry pacing out his watch hundreds of years ago savored much the same view, except for the haze, of course -- a result of Beijing’s pollution. Blue sky images of the Great Wall, we learn, are either rare or the result of some work with Photoshop. At 122 acres, the square ranks among the world’s largest open-air, urban spaces. A clock outside the Chinese National Museum facing the square counts down the days and minutes to the August 2008 Olympics. We expected students sprawled along the edges reading and kids playing ball. Neither is allowed. Unlike the central plazas in Krakow or Prague, cafes don’t line the perimeter and people don’t linger. Instead, white vans of police continuously cruise the concrete, circling close to groups, eyeing them. However, the kids flying kites humanize the square. Chairman Mao’s Mausoleum will likely pique the interest of older gradeschoolers as will the portrait of Mao, hung from a wall enclosing the Forbidden City across the street. 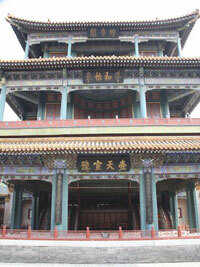 For centuries, the court for the Ming and Qing dynasties, the Forbidden City is both impressive and impersonal. The 7.75-million square-foot, walled complex features 9,900 rooms. The facility unfolds as a series outer and inner courtyards, each showcasing red pavilions roofed with glazed yellow tile. The vast expanse of paved ground, mostly barren of trees until the emperor’s private realm, conveys a sense of power and entitlement, however cloistered. To help kids understand the power politics of the buildings, ask them to look for the rows of carved, gold dragons perched on the eaves. The more dragons, the more important the building. Kids will also like the nine dragon screen wall made from glazed bricks and the Hall of Jewelry, showcasing such royal adornments as an elaborate gold dragon fly pin, a heavy jade bracelet, a red coral lion and other treasures. Another of Beijing’s iconic sites, the Summer Palace conveys a sense of the personality of empress dowager Cixi, the royal most associated with the retreat situated along Kunming Lake in a 716-acre park in Beijing’s western hills. Water laps at the life-size marble boat she had built and visitors still walk the half-mile long, covered corridor she favored. Legend has it that she built the structure so that she could promenade in the rain to admire the lake. The walkway’s blue painted pillars and ceiling feature scenes from Chinese history. Be sure to stroll the walkway, take a scenic boat ride on the lake and simply enjoy the greenery, something of a rarity in Beijing. The most human scale community we find in Beijing is the Back Lakes district. The area is part hutong, or traditional neighborhood, and part new western style cafés along Houhai Street, close to the lake edged with willows. The government leveled most of Beijing’s other hutongs to make way for high-rises. The easiest way to see this district is on a rickshaw ride. Our “guide” cycles us down narrow alleys, past gray stone walls that enclose one–story houses. Elaborately carved doors, signs of gentrification, grace a few of the entrances. Occasionally, through a partially opened gate, we glimpse a bicycle tire or a few tins. Although we encounter some children in the lanes who smile and wave, we mostly see other tourists as much of the life of the hutong goes on in the courtyards behind the walls. When we told our guide Andy that we wanted an authentic (but clean) place with freshly cooked food, he took us to Zhajang Noodle King, not far from the Back Lakes District. After we enter, the hostess shouts for a table for five and the waiters yell back their answers. When not loudly calling out a table, naming an order before slapping it down in front of a diner, the servers keep busy by stacking and rattling dirty bowls and plates in plastic tubs. It reminds us of a bustling New York, Jewish deli, Beijing style. As we are frequently told, Chinese people eat everything. We settle on noodles, rice, bean curd and chicken. The food, fresh and tasty, costs less than $25 for five people. Food is fascinating in China. Forget about being forced to eat fried insects for lack of other choices, but lots of crunchy critters are served, particularly in the street markets. On a stroll of Wangfujing Snack Street, we watch as locals purchase skewers of fried starfish, scorpions and cicadas. Similar munchies tempt residents in the nearby Donghuamen Night Market. Eateries and chain stores line Wangfujing Dajie, the largest pedestrian shopping street. Here, among other places, you can purchase “official” Beijing 2008 Olympics T-shirts, hats and souvenirs. However, most anywhere you go, vendors will come up to you hawking similar stuff. Deals can be had here as elsewhere, but be careful. Sometimes those name brand jackets may be the real thing, but most of the time, especially in the large shopping markets, vendors sell knock-offs. At the Hongqiao Market, also called the Pearl Market, vendors assail us as soon as we enter, yelling “Gucci, Gucci, just for you. Good price.” From what we see, little is authentic designer, but nonetheless we buy silk scarves and shirts as well as an extra piece of luggage. Be sure to bargain hard. Since music and acrobatics transcend the language barrier, our tour company, Asia Transpacific Journeys, books shows for us such as the Huguang Huiguan (Peking Opera Group), a traditional instruments concert and acrobatic shows. Of my entire family only I … eventually, like the Peking Opera Group’s performance. The falsetto dialogue and scratchy music sound to me, a bit like Minnie Mouse wailing. However, the colorful costumes, the elaborate face paint and the exaggerated body movements something like martial arts and ballet combined eventually to win my admiration. The private performance of classical music played on traditional instruments--a dizi (bamboo flute), an er hu (2-string instrument) and a sheng (a reed instrument)—delights us all. The flute, with a sound like a high-pitched harmonica, evokes a sense of longing in “River Water, ”a piece about a woman mourning her dead husband. In “Horse Race,” a folk tune from Mongolia, the pace quickens as the notes mimic the fast gallop of horse’ hooves on the steppes. Don’t miss China’s famed acrobats. They twirl plates, balance chandeliers, climb atop one another carrying chairs and perform other feats. Beijing offers a number of venues. Ask your hotel’s concierge to book tickets ahead of time for you at one of Beijing’s theaters. Popular venues are the Chaoyang Theatre, the Tiandi Theatre and the Tianqiao Acrobatics Theatre. Northeast of Beijing, the former Soviet era electronics plant, Factory 798, officially the Dashanzi Art District No.4, is a maze of brick buildings and pipes that house scores of galleries plus a few cafes. While the art may be avant-garde for China, much of the work seems ho-hum, but we do find some interesting pieces. Although the works change, we find the XYZ Gallery, New Art Warehouse, Factory 798 Space and the Beijing-Tokyo Art Project to be some of the best galleries. In August, 2008, the Olympic Games debut in China. Despite the hoopla, summer is much too hot to visit China. May, early June or September and October are the best times to explore this fascinating country. Outside of the Olympic Games period, airfares cost not too much more than a high-season ticket to Europe. But if you arrive outside of the Olympics, China can be affordable. Luxury hotels cost much less than comparable places stateside and a good meal for four can be had for about $25. Asia Transpacific Journeys: The agency listened to our requests for art, culture, shopping -- as well as the typical sites plus time in the country. Our custom trip included a private car, driver and guide in each city. Custom trips, depending upon lodging, start at about $350 per person, per day, including lodging, breakfast guide and transportation. Group trips are available. www.asiatranspacificjourneys.com. Raffles Hotel, Beijing Well-located a block away from the pedestrian shopping street Wangfujing and not far from the Forbidden City, the Raffles Hotel Beijing includes the façade and marble lobby of the former 1900’s Peking Hotel plus a newer wing. Featured on Conde Nast Traveler’s Gold list, the hotel offers over-sized rooms, an indoor pool and fitness facility, plus exceptional service. The business center provides laptops as well as snacks and in-room massages are available. After a long day of walking, treat yourself to the 45-minute foot massage for about $30. www.beijing.raffles.com. Award-winning travel journalist Candyce H. Stapen has authored 28 family travel books, including two for National Geographic. She has written more than 2000 travel articles and is the Adventure Living editor for BellaOnline.com. She lives in Washington, D.C.